The maiden budget of finance minister Arun Jaitley is disappointing for farmers as it has nothing in its kitty to address the increasing farm stress and resolve the ongoing agrarian crisis in the country. The much-awaited budget of the Bharatiya Janata Party-led National Democratic Alliance (NDA) neither talks about assured farm income nor gives any remedy to reduce farm stress—two major poll planks during the party’s Lok Sabha campaign. Kavitha Kuruganti from the Alliance for Sustainable & Holistic Agriculture, a network of farmers and agriculture non-profits, expressed disappointment that the government has not come up with any decisive shift in policy to address the crisis in farm livelihoods in India. “Much of what has been announced is a continuation of the earlier government’s policies and schemes. There is no emphasis to improve farm livelihoods despite a spurt in farmer suicides,” she says, adding that the budget does not take cognizance of the fact that 11,772 farmers killed themselves in 2013 due to stress. There were no surprises for the agriculture sector, except the Rs 1,000 crore Pradhan Mantri Krishi Sinchayee Yojana, which aims to improve access of farmers to irrigation facilities and reduce their dependence on monsoons to mitigate the risk of crop failure. An overview of Budget 2014-15 shows that Jaitley’s budget is old wine in a new bottle—schemes of the United Progressive Alliance (UPA) government presented in a slightly different avatar. Jaitley announced Rs 100 crore for providing soil health cards and Rs 56 crore for setting up 100 mobile soil testing laboratories. Soil health card is a tool to evaluate the health or quality of soil and determine its characteristics, including water, plant and other biological properties. It can help the farmer to monitor and improve soil health based on their own field experience and working knowledge of their soil. The idea of soil health card was introduced by UPA in 2008-09 under the National Project on Management of Soil Health and Fertility (NPMSHF). The scheme was approved for implementation during the 11th Five Year Plan with a total outlay of Rs. 429.85 crore. As per available figures, till 2012, 48.9 crore soil health cards had already been distributed and 1,049 soil testing laboratories established in the country. The finance minister said climate change is a reality which all of us have to face together. “Agriculture as an activity is most prone to the vagaries of climate change. To meet this challenge, I propose to establish a ‘National Adaptation Fund’ for climate change,” he said, adding that an initial sum of Rs 100 crore will be transferred to the fund. 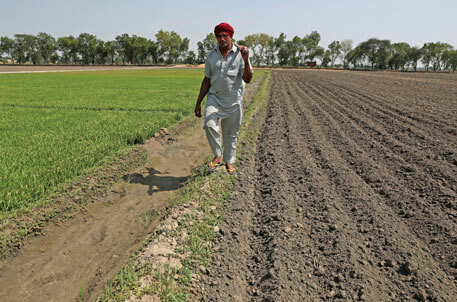 UPA government in 2011 had launched a project on the same pattern called the National Initiative on Climate Resilient Agriculture to enhance resilience of agriculture to climate change with an initial sum of Rs 200 crore. The project consisted of four components, viz. strategic research, technology demonstration, capacity building and sponsored/competitive grants. Another announcement made by Jaitley was to bring about a technology-driven second green revolution, with focus on higher productivity and protein revolution. The idea of a second green revolution was introduced by then UPA finance minister Pranab Mukherjee in 2010 with an initial outlay of Rs 400 crore under the Rashtriya Krishi Vikas Yojana. Even the protein revolution which Jaitley talks about was introduced by Mukherjee during his Budget speech in 2011 where he had announced Rs 300 crore to promote 60,000 pulses villages in rain-fed areas for increasing crop productivity and strengthening market linking. Following the tradition of his predecessors to announce special funding for new agriculture institutions, Jaitley announced the establishment of agriculture universities in Andhra Pradesh and Rajasthan and horticulture universities in Telangana and Haryana with an initial sum of Rs 50 crore for each. The proposal to set up a university in Andhra Pradesh has come up because Hyderabad-based Acharya N G Ranga Agricultural University has gone to Telengana after it was formed this year. Jaitley said farmers’ and consumers’ interest will be further served by increasing competition and integrating markets across the country. To accelerate the setting up of a national market, the Central government will work closely with the state governments to re-orient their Agriculture Produce Marketing Committee (APMC) Acts. Jaitley suggested the establishment of private market yards and private markets under this. APMC Act was introduced in 2003 during UPA’s rule. Amendments were later made to the Act facilitating private market yards, but not much could be achieved as agriculture is a state subject. Jaitley also announced Rs 500 crore for a Price Stabilisation Fund to mitigate the risk of price volatility. Kuruganti fears this move may become an excuse of the government to dismantle the foodgrain procurement system in India. “There has been an orchestrated effort in the recent past around this,” she said. However, she welcomed the additional support available under Producers’ Development and Upliftment Corpus for 2000 producer collectives. Government to establish two more Agricultural Research Institutes in Assam and Jharkhand with an initial sum of Rs 100 crore. A scheme to provide every farmer a soil health card will be launched. Rs 100 crore earmarked for this purpose and an additional Rs 56 crore allocated to set up 100 mobile soil testing laboratories across the country. An amount of Rs 100 crore set aside for “Agri-tech Infrastructure Fund”. 200 crore provided to set up agriculture universities in Andhra Pradesh and Rajasthan and horticulture universities in Telangana and Haryana. To meet the vagaries of climate change, a “National Adaptation Fund” with an initial sum of Rs 100 crore to be set up. Rs 500 crore earmarked for “Price Stabilisation Fund”. Sum of Rs 50 crore allotted for the development of indigenous cattle breeds and an equal amount for starting a blue revolution in inland fisheries.